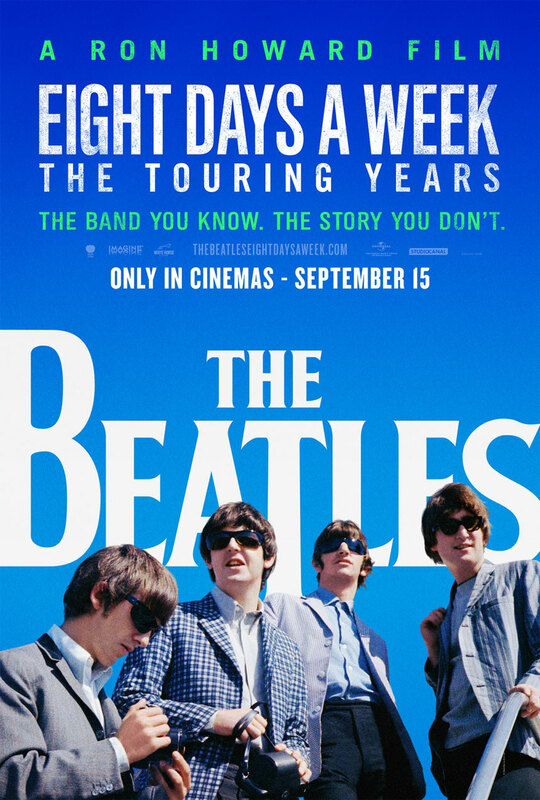 Directed by Ron Howard and collating footage from many various sources, some of it having never been seen by the public, Howard sets out to appease and delight the die-hard fans and introduce the millenials to the phenomenon of The Beatles to show how extraordinary the group, the time and their journey was. It is indeed a story worth telling, again and again. Almost everything has been said or written about the fab four from Liverpool…..almost, which is why this is such an entertaining, enlightening documentary. A call was put out to fans in 2013 to acquire film footage, photos and audio recordings of the band between the global touring years-1963-1966, the results speak for themselves. Over two hours (including 30 minutes of The Beatles live at the Shea Stadium, New York) of old footage, photos, new interviews with Paul McCartney, Ringo Starr and archive conversations with George Harrison and John Lennon alongside reminiscences by Whoopi Goldberg, Elvis Costello, Sigourney Weaver, Eddie Izzard and more, this is a fine meal and well worth your attention. This film charts that time during these four young lads’ journey into stardom, success and fame, not being without its price. You get to see these talented young dudes being swept up in a fervor like never before. They unleashed an energy the likes of which have never been seen before. Sure, bands can enjoy extreme popularity, longevity and still remain relevant for years after but the experience of The Beatles emergence onto the world’s stage was a game-changer for the world of music. Speaking of fervor, it occurred to me as I saw the hordes of screaming fans greeting them all over the world that this was a new occurrence at that time. Teenagers didn’t really exist until the 20th century. What I mean is ‘teenagers as we know them’ (as we were one), it started in the late 19th century and grew into what we know it to mean here in 2016. It is a generalization but before that you were a child and then you went to work as an adult. So, in 1964 when The Beatles went to America, and with the massive popularity of their single I Wanna Hold Your Hand, teenage girls took adoration to a next level. These images of young girls screaming and fainting have been seen time and time again since but never to this level in a world where it didn’t exist before. This helped catapult The Beatles into the annals of history. Look at most boy bands today, they are effectively marketed towards young girls, that’s where the dollar is. Interestingly, we find out that The Beatles were the first musicians to play at the famous Nippon Budokan arena in Tokyo, Japan. It was originally a martial arts arena and the concert was met with opposition from protesters that felt the music would defile the sacred martial arts space. This venue went on to become host to many great concerts over the years. Ron Howard directs this documentary with skill and style in what must have been a mammoth task, trawling through all the audio and visual footage and manages to create this hugely enjoyable film that will most certainly appeal to fans and the uninitiated alike and is a phenomenon to behold and definitely worth a watch. This will be in the cinemas for one week only. Don’t miss.